Why do your pictures come out too dark or light?? Digital cameras all have metering systems in them, which sets the shutter, lens aperture (f-stop) and sometimes the ISO speed to the correct settings – the combination of these items determines the "exposure". If it doesn’t do this correctly, your image may come out too light or too dark. These systems are designed to expose for an "average" scene – that is, one having a relatively equal range of tonal values from light to dark. If the scene you’re taking isn’t "average", your camera gets fooled and the exposure won’t be correct – that is, it may be too light, too dark or lacking in color (especially in sunsets). Your camera's metering system measures how much light is reflected back into the camera. But, the correct exposure is based on how much light is falling on your subject, not the amount reflected from the scene. Since light objects reflect more light and dark objects reflect less light, they can fool your camera into thinking either more or less light is falling on your subject. Snow or Sand: If you’re taking a picture of a person surrounded by snow or light sand, more light is reflected from the snow than from the person. This will fool your camera into thinking that there is more light on your subject than there really is, and your image will come out too dark. Backlit: If your subject is backlit, your subject will be in shadow, and will have very little light falling on it. But the very bright background will fool your camera into thinking your subject has more light on it than it really has, and your subject will come out too dark. Sunrise & Sunsets: Since the sky is so much brighter than the foreground, the camera overexposes the sky - thus the colors become washed-out. Object Photography on a light or dark background: If you are taking a picture of a small object that is on either a white or black background (such as you might do when selling something on eBay), the camera may get fooled by the background. A white background may cause your object to come out too dark; a black background will cause it to come out too light. There are several easy ways to resolve this. You may see the term "EV" mentioned in reference to camera exposure. The term "EV" stands for "Exposure Value". It represents a combination of shutter speed, f-stop and ISO speed that determines the exposure - how much light reaches your camera's sensor. In this eTip, I refer to "1EV" or "2EV", etc. - this is a reference to a "change" in the exposure of 1EV or 2EV. You can relate "EV" to f-stops, shutter or ISO speeds. Each f-stop is equivalent to 1EV change. For example, going from f5.6 to f8 reduces the exposure by 1EV. Going from f5.6 to f2.8 increases the exposure by 2EV, etc. Likewise, changing the shutter modifies the exposure value. Going from 1/125 of a second to 1/250 second reduces the exposure by 1EV. Going from 1/125 of a second to 1/30 second, increased the exposure by 2EV. Changing the ISO speed from ISO 400 to ISO 800 is equivalent to a reduction of 1EV. Changing the ISO speed from 400 to 100 increases the exposure by 2EV. Dynamic Range descibes the ability of your camera to capture all of the tonal values your eyes see. Your camera CANNOT see everything your eyes can. You can see detail in black and white objects with your eyes; your camera can't. Basically, it can only see a portion of the tones your eyes can see, thus, exposing scenes with very bright and dark areas can become a challenge. This chart shows approximately what your camera can see - you can choose for it to capture detail in the highlights or shadows - but not both. P.S., You may also want to check out our eTip on Dynamic Range as well. Digital cameras have a feature called "Exposure Compensation". It may be a dial or button on your camera or it may be accessible from a menu choice. Look in your camera manual or our CheatSheet to find out where this feature is accessible from. If you take a picture that’s too dark, simply select a "positive" exposure compensation value. Generally, most cameras can select exposure compensation values from +3EV to – 3EV (some cameras allow from +5EV to -5EV). Try starting with +1 EV. This setting lets in twice as much light as the camera "thinks" it needs for the proper exposure. If the image is still too dark, try using +2EV. This setting lets in 4 times the amount of light the camera "thinks" it needs for the proper exposure. The higher the setting, the lighter the image will be. 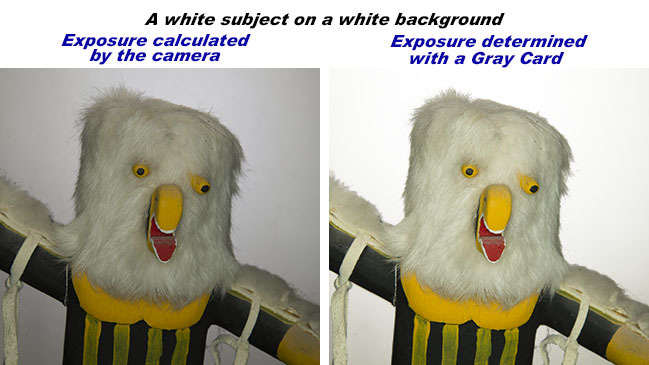 Likewise, if an image is too light, select a "negative" exposure compensation value. This is an invaluable technique when photographing sunrise or sunsets. In these scenes, the foreground is often very dark and the sky is very bright. The camera’s metering system "averages" the light in the scene so the sky becomes washed-out, with no color. By using a negative exposure compensation, you can darken the sky so the color in the sky is properly exposed. This technique can dramatically improve your sunrise/sunset pictures. In order to use Exposure Compensation, or just about ANY other feature in your digital camera, you can't use the "AUTO" exposure mode; if you don’t want to fuss with the shutter, aperture or ISO speed, you can always use the "P" (Program) mode instead – this mode is the same as "AUTO", except you have more control over your camera. When you’ve completed taking your picture(s), be sure to set the exposure compensation back to ZERO. (Note: some cameras do this automatically when the camera is turned off, but most don’t). The images below are JPEG images right out of the camera - the first was taken with no exposure compensation. You can see how underexposing a sunset picture can greatly enhance the color. If you want to get your exposure DEAD-ON every time, use a gray card. A gray card is just what it sounds like – a piece of cardboard that is gray – 18% gray, to be exact. The metering system in your camera was calibrated to expect all scenes to reflect the same amount of light that is reflected from this shade of gray. Use of a gray card is simple: just set your camera to an automatic exposure setting (P, S (Tv), or A (Av)) and fill your frame with the gray card, making sure the light falling on the gray card is the same as the light falling on your subject. Remember the f-stop and aperture setting your camera displays in the Viewfinder. Then set your camera on "manual" exposure mode and set the exposure to what the camera determined was correct when you filled the frame with the gray card. Remove the gray card from the scene and take the image. Consider the images below. The one on the left was taken in "auto" mode, where the camera determined the exposure. The WHITE background and subject are gray - because the camera thought there was more light than there really was, so it underexposed it. Using the gray card, a better exposure was determined, and the image on the right is correctly exposed. When you use a gray card to determine your exposure, your metering system accurately calculates the exposure since the light reflected from your the gray card is exactly what it was calibrated to meter from. 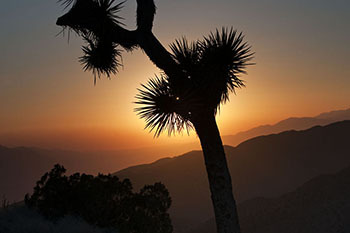 Exposure bracketing is a feature that most digital cameras have. It allows you to take multiple shots of the same scene, each with a different exposure. Many cameras are set to take 3 images, but some let you take between 2 and 5 images. You basically press the shutter multiple times (one for each shot) and the camera varies the exposure on each shot by a value that you choose – usually 1EV. This is a good feature to use when you think the camera may get fooled by a very light or dark subject. You end up with multiple images – one underexposed by 1EV, one taken with what the camera thinks is correct and one overexposed by 1EV. You will most likely delete all but one – the one that comes out best. 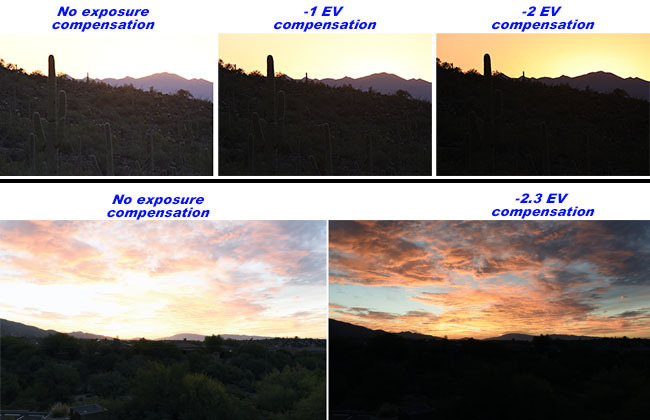 You can also combine exposure bracketing with exposure compensation – let’s say you know the camera thinks there’s more light than there really is (e.g., photographing a sunset). If you set the exposure comp. to -2EV and take three exposure bracketed shots varying by 1EV – which will end up taking one at -3EV, one at -2EV and one at what it thinks is the correct exposure. Your camera tries to get the exposure right, but, as you know from experience, your images don't always come out the way you want them to. Often, they are too dark, too light or don't have enough color. Camera manufacturers recognize the camera shortcomings, so they have provided you with the tools you need to correct, when necessary. Using these tools WILL improve your images!